What does a "Custom Rifle" mean to you? Custom hunting rifles can be tools for the ultimate hunting trip, the once in a lifetime trip for Alaskan moose, the Africa trip for plains or dangerous game, or just the best deer rifle you have ever had! Custom target rifles can take you to the top of your shooting game whether you shoot 22's or across the course. Having a custom big game hunting rifle built is for some a trip into a fantastic world of days gone by. The ability to rejoice in the feelings we have for the hunt or in reliving a Jack O'Connor hunting story for ourselves. Custom rifles are an extension of ourselves they should be as comfortable and reliable as your well worn hunting boots. Blued steel barrels and walnut stocks are things of beauty and warmth that can take you to places you have always dreamed of. Rugged all weather rifles of stainless and Kevlar are well suited to harsh and nasty climates, tools that can take you to different places where you can make your own memories, memories you can pass on. We build all our custom rifles with precision and accuracy, whether it is for hunting or target. A rifle has to shoot great first, then it gets beautiful. We start with the heart of the rifle, the barrel. The barrel must be the finest available, at HCS we know from past experience with cut rifle barrels that they have the performance we are looking for. Our attention to detail during action preparation and the barreling process guarantees the finest possible accuracy from these barrels. 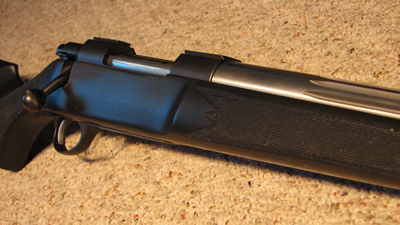 The barreled action is then hand fit to the stock material of your choice. Proper pillar bedding and care is given to assure that the inherent accuracy is maintained once the stock is fit. A barreled action that shoots great in a machine rest is of little use to the man in the field. Finally, the scope is mounted in correctly machined rings and bases. At HCS we strive to build the best shooting guns you have ever owned. Come see what a really good gun shoots like.